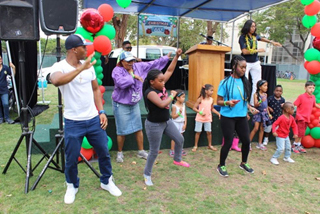 “Christmas-in-July is an annual event aimed to support working-class families during the summer months when children are out of school and programs are limited. Many families face unemployment or underemployment, limited resources, rising costs, over-burdened and under-funded schools, and diminishing access to quality child care,” said Mitchell. In addition to the e-readers, bicycles, books and health screenings, children and their families chose from a variety of activities from zip-lining to rock-climbing, a bike-safety and skills course to the latest video games, ways to save water, the environment, and exotic wildlife, and Lego robotics and coding to film-making. No child left empty-handed and all families were welcomed. A variety of for-profits and non-profits contributed funds and gifts to the event.